Promote MailerLite and earn 30% of every sale! When you become an affiliate, we'll provide you with a special affiliate link. 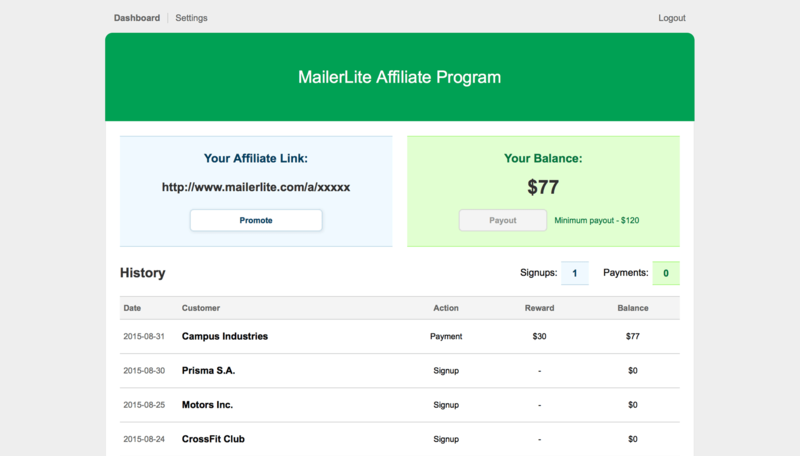 You can put the affiliate link on your website or social networks and refer businesses in need of email marketing software to MailerLite. When a new user visits and signs up at MailerLite via your affiliate link, our system instantly identifies that they’ve come from you. When a purchase is made by your referral, you will automatically receive a commission. When someone you refer to us orders an account, you'll earn 30% of both the initial sale and the recurring payments. We'll provide you with a special Affiliate Dashboard where you can monitor your referral signups, purchases and the subsequent payments to you. You’ll also receive marketing materials that you can use to successfully promote and sell MailerLite. Once you’ve made $120 in commission, you can request a payout and we’ll send your money directly to your PayPal account. It's that easy!